RECLAIMED wood, concrete and exposed steel preserve the industrial character for Officine Brera in the DTLA Arts District. Los Angeles has always had a remarkable approach toward architecture, with examples of Beaux-Arts, Art Deco, Mid-Century Modern and Modern architecture found within its sprawling neighborhoods. And in recent years, well-known architects like Frank Gehry (Walt Disney Concert Hall) and Renzo Piano (Broad Contemporary Art Museum) have continued this tradition with large-scale projects that have transformed the city’s skyline. Now, building on this legacy, one design firm wants to bring that kind of cutting-edge architecture to a restaurant and bar near you. The firm, “(fer) studio,” takes its name from the principles who describe its design philosophy: form, environment and research. Its founder, Chris Mercier, says he started the studio in 2002 to be a place rooted in modern design. When he left Gehry’s, Mercier had four initial projects lined up. “But within the first month all four projects, for various reasons, fell through,” laughs Mercier. This left him forced to pick up small residential garage and kitchen repurposing projects. “It was a challenge for the first few years,” he says. It was this work, however, that allowed (fer) studio to grow and begin specializing in restaurant and hotel projects. In 2005, Mercier was joined by another former Gehry associate, Douglas Pierson, and the firm hasn’t looked back since. Based in Inglewood, (fer) studio now employees 14 people and is a leader in a wave of urban renewal across the city. Always a fan of Modernism, Mercier says he is also passionate about how contemporary work interacts with its environment. Through intensive research and the study of site and/or environmental conditions, (fer) studio aims to create a project that emerges as both appropriate and unique. “In regards to contributing to a culture as an architect, I think it’s better to look forward as opposed to being nostalgic and looking back,” says Mercier. 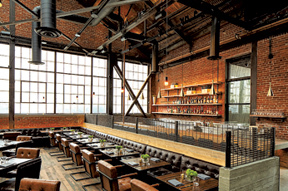 In recent years, the firm has completed restaurant projects that include Father’s Office in Culver City, Connie & Ted’s in West Hollywood and the newly opened Officine Brera, located downtown in the Arts District. FRONT entrance to Officine Brera. For Officine Brera, Mercier says the biggest challenge was to re-imagine the existing space—an early 20th century industrial warehouse building of masonry and steel that once housed the Los Angeles Gas Company. 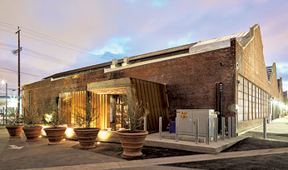 He wanted to preserve the industrial character of the 8,000 square foot building by using reclaimed wood, concrete and exposed steel, while creating a restaurant with a northern Italian vibe. “What was crucial was how to celebrate the scale of the room while at the same time creating a sense of intimacy,” says Mercier. Currently, the firm is working with the Hollywood Roosevelt Hotel to help redesign a rooftop event space for private events. For more information, visit ferstudio.com.